Slowly, deliberately, but surely I’m working on a set of Photoshop Filters and Actions that’ll be marketed primarily to the photography market. I mean, everyone is running around these days with a camera thinking they’re a photographer. And for good reason, even low priced point and shoot cameras can take incredible shots. Below is one of the effects I’ve recently developed. It’s primarily for faces (so far) and generates a surreal effect. Not quite cartoon and not quite photographic. 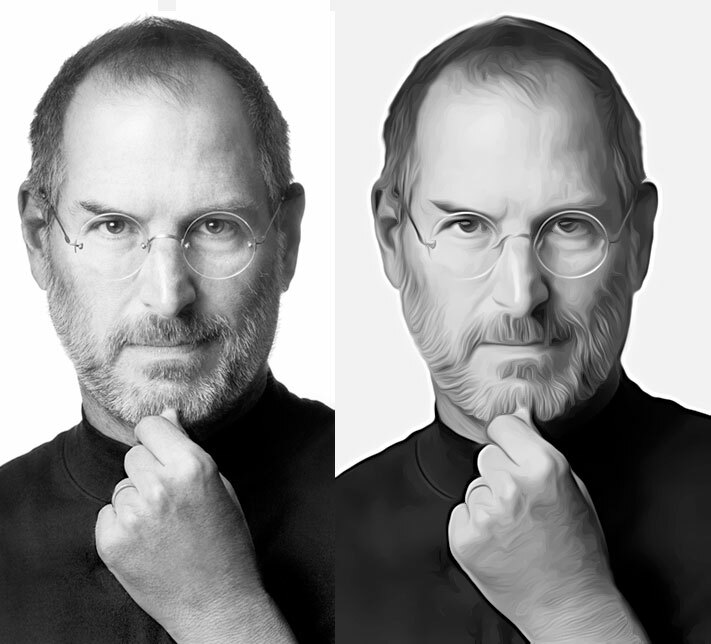 The transformation of the Steve Jobs image below is quite unique and I don’t recall ever seeing anything like it. It took many hours to get it right although further work is needed to refine it for all images from low resolution jpegs to high resolution magazine quality images. The most pleasing effect is the rendering of the hair and the manner in which the filter smooths the image yet retains sufficient detail and sharpness. Expect more to come shortly. Clicking the image will open a full size jpeg.